The Mojave Desert has been inhabited by people for some time. Like most places on earth, the Mojave desert has undergone climate change even before the advent of car exhaust. 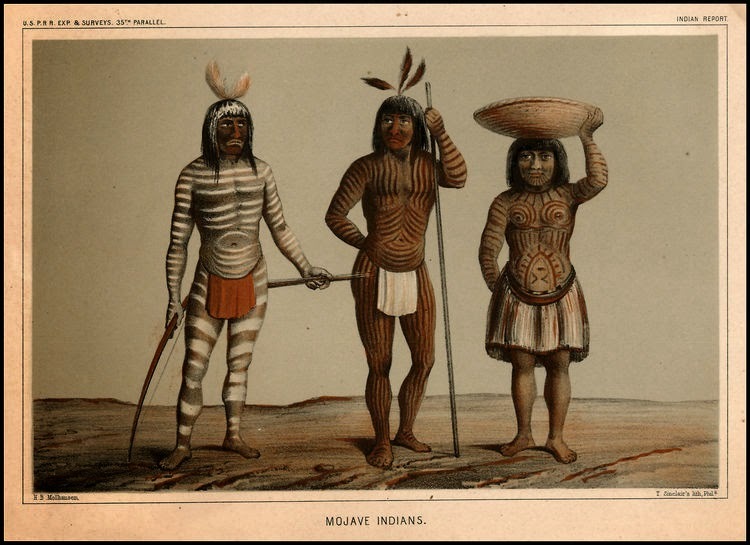 But for the last few thousand years before the coming of Europeans, the Mojave has been a desert and has been inhabited by people looking something like those in the picture above. The need for clothing was minimal and in the absence of clothing to decorate one's body, one could paint directly on one's skin. Adorning of the body was a normal human urge. The adorning of one's environment was also a natural human urge. There is evidence of this throughout the world and the Mojave is no exception. Here is another example of this urge, this collection of petroglyphs being somewhere in New Mexico. Theories of what these petroglyphs signify abound but there is no clear agreement. I personally think that the urge to mark one's environment is universal and needs no explanation, but others think differently. The natives who have lived on this land since before the arrival of the Europeans do not agree with my theory. 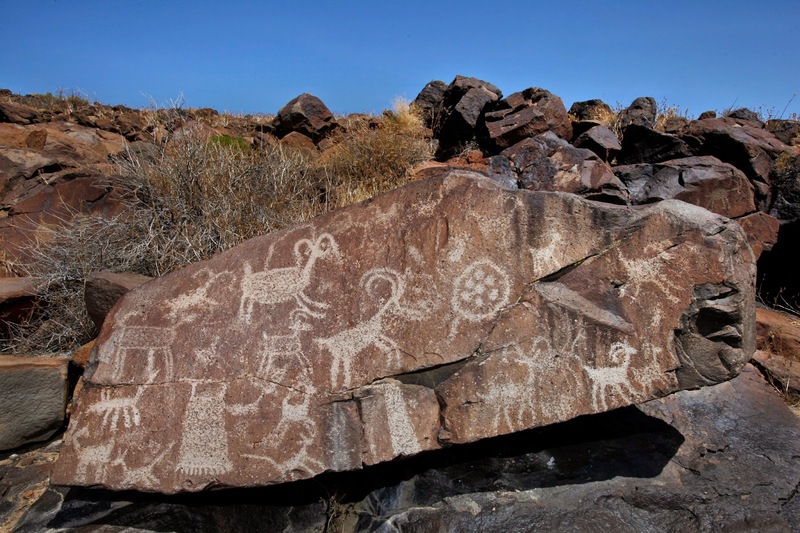 Author Kenneth Lengner interviewed various members of the Timbisha Shoshone who live in what is now called Death Valley and they told him that petroglyphs were not created by humans but rather by supernatural beings that they call rock babies. 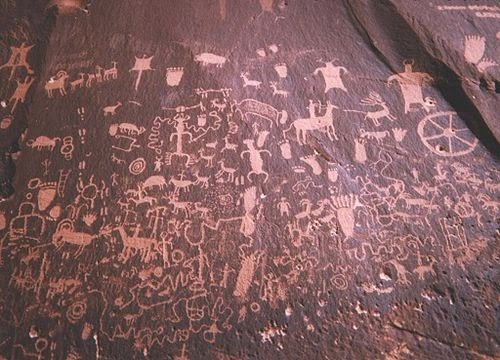 In their view, since the petroglyphs are not created by humans, human urges cannot be said to be the cause of these petroglyphs. So various anthropological explanations for the origins of the petroglyphs have no merit in their view. The lower pic is Newspaper Rock in Needles District of Canyonlands National Park in Utah. This drives me crazy! Am I the only one who, when seeing petroglyphs, can also easily imagine parents handing toddlers suitable stones and saying, "Go draw so I can cook dinner."?!?! The fact that colleges produce, as a common product, people who insist on imagining some great significance, is simply silly.